The N 36 u-ring is produced in a compact design which guarantees good functioning at low pressures and guarantees a particularly long service life. The N 36 has a symmetrical design that allows application as a piston and rod seal. Seals made of TPU are very robust and are particularly suitable for application in mobile hydraulics, especially in the earth moving machine area. 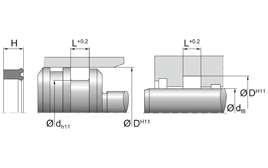 The N 36 seal is also designed for installation housing conforming to ISO 5597. It is primarily used in ground conveyors, agricultural and injection moulding machines as well as in cylinders for mobile hydraulic platforms and steering cylinders. 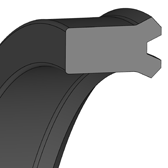 For extreme applications, this seal design can also be provided with a second seal lip or an integrated back-up ring.